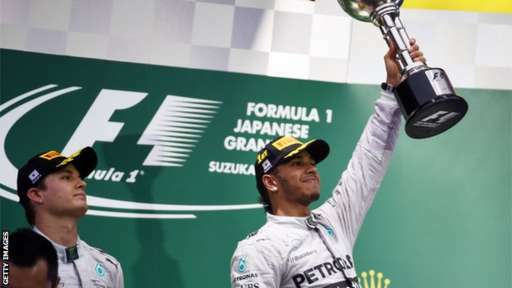 Lewis Hamilton has won the 2014 Japanese Grand Prix in a weather affected race that was started and ended under the safety car. Nico Rosberg remained in 2nd after starting from pole position as he seemed to struggle with over-steer throughout. Sebastian Vettel took 3rd place. The race was marred by a severe crash in the closing stages of the race for Jules Bianchi. Recovery trucks were attempting to lift Adrian Sutil’s Sauber off track when Bianchi lost control in the wet conditions and hit the truck. He has been taken to hospital and we are awaiting further information. The forecast rain from Typhoon Phanfone had finally made an appearance as the race approached. The officials elected to start the race under the safety car. After 2 laps of running, the race was red flagged due to the treacherous conditions which had seen Marcus Ericsson spin in his Caterham. A 15 minute wait in the pit-lane followed before the drivers began to circulate behind the safety car once again. Fernando Alonso’s race ended under the safety car after his Ferrari appeared to grind to a halt at turn 6. It wasn’t until lap 10 that the race finally got under-way, with Rosberg leading Hamilton into turn 1. The track had dried sufficiently enough for some drivers to immediately pit for the intermediate tyre compound. Jenson Button and Pastor Maldonado were among those who did. Jenson soon started to match the pace of the Mercedes cars in front, causing many drivers to pit in reaction to the McLaren who had briefly been in last place due to his stop. The two Red Bull and Williams cars pitted to defend their position, but it was too late, Jenson was up into 3rd place behind the two Mercedes cars in front. Rosberg pitted from the lead on lap 14, with Lewis staying out and pushing hard. He stayed out an extra two laps, but he went wide at Spoon; costing him valuable seconds. He would emerge from his stop just over 2 seconds behind Rosberg. Daniel Ricciardo and Sebastian Vettel were making gains through the top 10 for Red Bull. Their cars quickly became the fastest on track and were able to pull off astounding moves on the Williams cars. Ricciardo somehow went around the outside of Felipe Massa in the Esses section and then repeated it a few laps later on Valtteri Bottas. Sebastian Vettel then came across the Williams cars. He dived up the inside of Massa at the hairpin and then moved around the outside of Bottas in the same corner a few laps later. Back at the front, the fight for the lead was getting closer. Rosberg was seemingly struggling with over-steer in his car which was allowing Hamilton to close to just over a second. On lap 24, conditions improved enough for DRS on the start/finish straight to be activated. Hamilton closed to within a second and started putting pressure on the German. Rosberg, like in qualifying, appeared to have the edge in the first sector, with Hamilton fighting back in the last two. Hamilton had a scare at turn 1 when he ran wide at the same place where he had crashed in practice 3 on Saturday, but luckily he was able to gather up the car and only lose around a second to Nico. Hamilton’s pace was as such that he was almost immediately back on the gearbox of Rosberg. He was closer than ever as the pair crossed the line to start lap 28/53. Rosberg went defensive as Lewis drove to the outside of him into turn 1 and somehow managed to make it stick. AS soon as Hamilton had taken the lead, he subsequently cruised ahead; pulling out a gap of roughly 9 tenths of a second per sector. With Hamilton building a 4 second lead in just 2 laps, Rosberg’s thoughts now turned to the people behind him. Jenson Button was only 12 seconds down on the Mercedes until the Briton had to pit for a new steering wheel. Jenson’s team-mate Kevin Magnussen had reportedly also changed wheels earlier in the race due to an electrical fault. This elevated Daniel Ricciardo and Sebastian Vettel into 3rd and 4th. Mercedes decided to pit Rosberg for a new set of Intermediates, with the German rejoining behind Ricciardo. Hamilton followed Rosberg in 2 laps later on lap 35, which promoted Ricciardo briefly into the lead until he pitted a lap later. 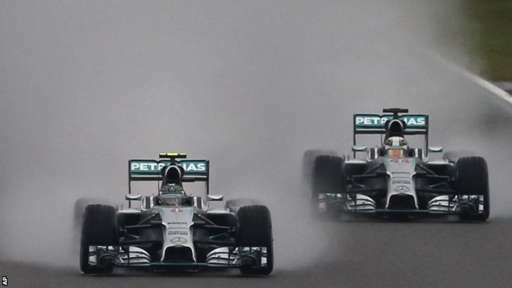 With 16 laps left of the Japanese Grand Prix, rain started to close in once again. 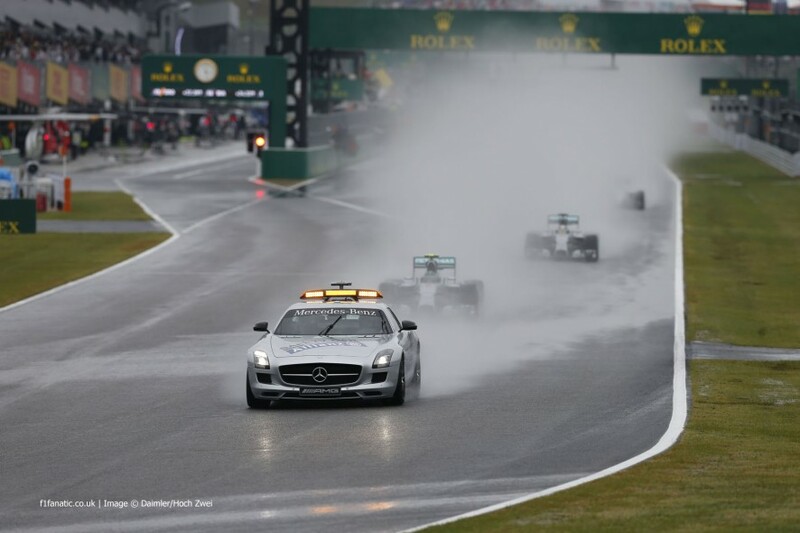 The rain was soon at the level that it was at the start of the race, but no safety car was called out. Daniel Ricciardo has rejoined after his stop behind Jenson Button. The Australian launched his car up the inside of the hairpin on lap 40, but the superb traction of the McLaren allowed Button to retake the place. Ricciardo thought about trying again on the next lap, but Jenson took a wide line to hold him at bay once again. He decided to pit for full wet tyres due to the rain getting even heavier on lap 42. He was hoping that this would be another inspired tyre change that would see him improve over the last 10 laps. Those 10 laps would not be played out however. Adrian Sutil’s Sauber had aquaplaned off of the circuit at Dunlop corner and had hit the barrier. Sutil got out of the car fine and the recovery team set about removing the car from the track with a JCB moving crane. The area of track was placed under yellow flags, but unfortunately on the next lap, Jules Bianchi’s Marussia similarly went off and struck the crane and went underneath it. The race was put under safety car, then red flagged and then ended. Lewis Hamilton was declared the winner of the 2014 Japanese Grand Prix, with Nico Rosberg in a disappointing 2nd place which would put him 10 points off of Hamilton heading into the next Grand Prix in Sochi, Russia. Sebastian Vettel claimed his 2nd podium finish in a row for Red Bull, with Daniel Ricciardo taking 4th thanks to Button’s late pit-stop. The McLaren driver would hold on to 5th place. Valtteri Bottas and Felipe Massa’s Williams cars took 6th and 7th ahead of Nico Hulkenberg and Jean-Eric Vergne; with Sergio Perez making it two Force India’s in the top 10 in the final points paying position. Sebastian Vettel’s newly announced replacement Daniil Kvyat was just outside of the points in 11th ahead of Kimi Raikkonen; who capped off a poor weekend for Ferrari by scoring no points after Alonso’s early retirement. *Pastor Maldonado recieved a 20 second time penalty for pit-lane speeding. Note: Results were taken on lap 44 of 53 after a race ending red flag on lap 46. After the race, the FIA released the following statement regarding Jules Bianchi’s crash: “On lap 42, Adrian Sutil lost control of his car, spun and hit the tyre barrier on the outside of turn 7. The marshals displayed double waved yellow flags before the corner to warn drivers of the incident. A recovery vehicle was despatched in order to lift the car and take it to a place of safety behind the guardrail. While this was being done the driver of car 17, Jules Bianchi, lost control of his car, travelled across the run-off area and hit the back of the tractor. “Once the marshals reported that the driver was injured, medical teams were despatched and the Safety Car was deployed. These were followed by an extrication team and an ambulance. “The driver was removed from the car, taken to the circuit medical centre and then by ambulance to Mie General Hospital. “The CT scan shows that he has suffered a severe head injury and he is currently undergoing surgery. Following this he will be moved to intensive care where he will be monitored. My thoughts and prayers are with Jules Bianchi and his family at this time. I will report on any new developments as they come to light.